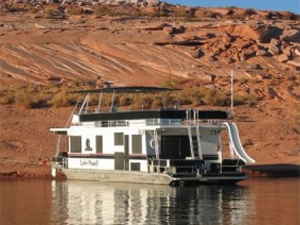 Are you looking for Lake Powell Houseboat Rentals? For those people who have ever wanted the ultimate water sports, fishing, jet skiing, or sightseeing houseboat vacation; Lake Powell is the most visited houseboat lake in the world. Lake Powell is located in Southern Utah, and partly in Page, Arizona with six different operating marinas. Four of these Lake Powell marinas offer Lake Powell houseboat rentals including; Wahweap Marina, Antelope Point Marina, Bullfrog Marina, and Hall’s Crossing Marina. Lake Powell is part of the Grand Canyon with its steep red rock canyons and breathtaking views; staying on your own private Lake Powell houseboat is a trip you will never forget. The lake is great with its hidden coves and winding coastlines, perfect for your ski boat rental, Jet Ski, or water sport adventure. Our Lake Powell Houseboat Rentals can help with your Lake Powell houseboat vacation rentals from picking the right size and amenities; to setting up your perfect wakeboard boat and jet ski rental combo package. 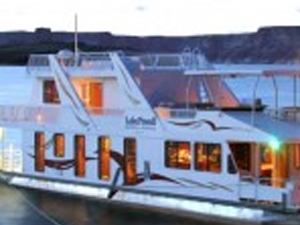 There are 18 different houseboat rentals to choose from at Lake Powell varying from inexpensive to a 75’ luxury houseboat where you’ll feel right at home.